Fairly quiet Easter sunday mostly indoors. Erika having a pre-lunch snack on her own little table set up in the hallway. I like this yellow overall she's wearing too, a present from Chie's friend Ochiai-san. 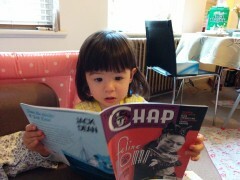 Erika leafing through the pages of the Chap.